Winner: St. Philip’s Academy, Gensler, Structure Tone, Inc.
A former chocolate factory has been given new life as a school for more than 300 students from kindergarten through eighth grade. St. Philip’s Academy offers a rich, diverse curriculum and a nurturing environment in order to accelerate the achievements of its students and close the minority educational gap. After a three-year planning and implementation process, the spacious new facilities opened in January 2007. 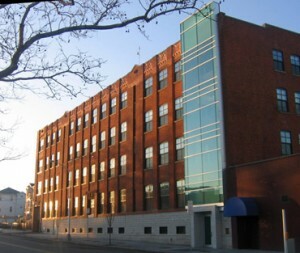 The new location of this independent elementary school, which had been severely overcrowded, is in itself an advantage because it is well situated in Newark’s University Heights district near four universities, downtown Newark, and residential neighborhoods, and within easy reach of bus lines and the subway. In addition to the strength of its location, the building also has unique physical aspects. The adaptive reuse maintains the character of the five-story manufacturing building from the 1920s by keeping its brick and terracotta façade. The new curtain glass wall at the entry of the school is a literal beacon of optimism and opportunity, especially at night. Parents, students, teachers, and donors engaged with architects to design the various spaces that make up the school complex. St. Philip’s boasts state-of-the-art classrooms and offices, a science lab, a media center, a computer lab, and a cafeteria as well as a new gymnasium with an indoor-outdoor stage, outdoor playground areas, and a rooftop environmental center. Parking and drop-off areas are located across the street. The building’s thoughtful design—which features visible utility systems, a recycling and composting program, and a weather station—is itself an environmental teaching tool. LEED signage encourages the students to engage in discovering the building’s mechanical, structural, and environmental elements. St. Philip’s Academy will be the first completed building in Newark to receive LEED certification and is being considered for LEED 2.0 Silver status due to its building reuse, reduced water usage, and energy consumption. As time progresses, St. Philip’s Academy plans to increase its outreach to the community by offering programs in health awareness, technology, e-literacy, environmental sustainability, continuing education, and fitness. Founded in 1988 by the Dean of Trinity and St. Philip’s Cathedral in the Newark Episcopal Diocese, St. Philip’s was conceived as a school where inner-city children from Newark and its environs, regardless of financial background, could obtain a first-rate education and be prepared to succeed at top secondary schools. In addition to academics, St. Philip’s Academy promulgates a philosophy of love and respect for all humanity, as well as for the planet. It has placed 100 percent of its graduates, many at prestigious institutions throughout the country, and maintains a close, nurturing relationship with its alumni. Most of the students come from Newark and Essex County. St. Philip’s subsidizes at least 50 percent of every child’s tuition, and more than two-thirds of students receive additional financial aid, based on family income. The school secures its funding through gifts and donations from companies, foundations, and individuals. It receives no city, state, or federal financial assistance. St. Philip’s Academy is an inspiration both for its students, who enjoy an innovative, high-quality educational environment, and for the community at large, for which the fresh, engaging architecture stands as a sign of hope for the future. By building a strong community presence and promoting a sustainable future, St. Philip’s Academy exemplifies the full potential of smart growth development.